Is there anything Rory can’t do? Recently I’ve had this vision of poor Rory laid out on the couch sporting that ‘moon boot’ from his unfortunate accident, unable to do anything but relax and catch up on the fortunes of his favorite football team, Manchester United. Somehow this doesn’t seem to be the case as this amazing video proves otherwise. The world no. 1 took to Whistling Straits , the home of the US PGA Championship, with popular golf tricksters – the Bryan brothers. 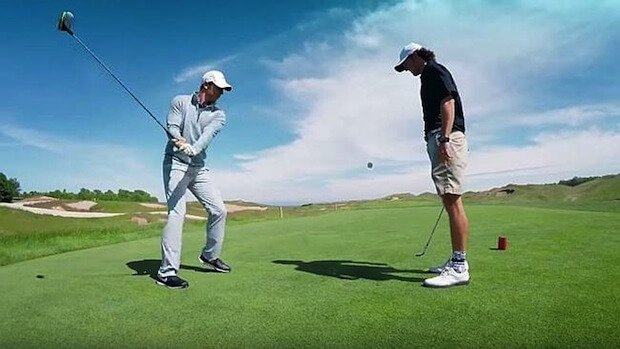 In the video for Bose headphones, McIlroy struggles at first with a few attempts, but soon enough his natural talent has him nailing trick shot after trick shot. Think you could pull it off like Rory can?? Tell us what you think below.